At FaithAction we are always keen to hear of examples of mental health services and faith groups working together: something that connects with our Friendly Places initiative and our work with mental health charity Mind. In this guest blog, Don de Silva, a Buddhist university chaplain, environmentalist and mental health volunteer, reports on a two-day interactive workshop in mindful listening and speaking, held in association with Mind. If we are talking and no one is listening, maybe not even our own selves, we are not communicating effectively. 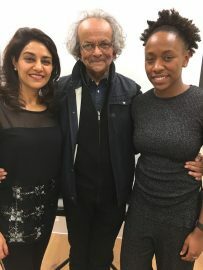 Mindfulness techniques, together with Hatha Yoga and voice and drama sessions, combined to form an innovative workshop on mindful listening and speaking organised by the Bridging Cultures project run by mental health charity Mind in Harrow. The workshop was held at the Jaspar Centre in Harrow and was attended by some 28 participants. It was delivered by a team of three trainers: Sangeeta Bhandari, a certified yoga instructor and specialist in Vedic history, Teri Ann Bobb Baxter, an actor and founder of Speak Up UK, and Don de Silva. Don de Silva said that the workshop was “an experiment”. “This will not be one of the usual mindfulness training programmes, where you sit on a cushion for long periods”, he told participants. Faith groups are … uniquely placed to support those who find it difficult to access mainstream services because of language or cultural barriers. Why mindful listening and speaking? The way we listen and talk is a critical part of our mental wellbeing. Our personal, family, workplace and academic lives are dependent on it. Effective communication determines how well we interact with one another. But listening and speaking are not natural skills. Our values, attitudes and experiences often determine what we pay attention to. Often, the result is a restricted ability to engage, leading to conflict, hurts and ill-health. The workshop was interactive and participatory, but also provided an understanding of the Vedic and Buddhist roots of mindfulness aspects of communication. Sessions included voice and drama, mirroring, tongue twisters, and mindfulness and meditation techniques, chanting for healing and yoga for wellbeing. The workshop enabled participants to understand the difference between hearing in an autopilot mode and listening reflectively with intent and purpose. Participants took away techniques to improve listening, communication and learning skills. Sangeeta Bhandari pointed out that the Vedic teachings on meditation, mental health and wellbeing date back several thousand years. They highlight the importance of regular daily practice. Participants were given a ‘basket’ full of practical tools to help train the mind on a daily basis in becoming more aware, mindful and focused. Teri Ann Bobb Baxter said that acting involves being present at the moment. This presence enables you to be more compassionate and less bored or negative. It enables you to empathise and connect with others to understand how they feel and think. It changes how you interact with others; how you look, listen, think, feel and learn. Don de Silva said that in the West, mindfulness teaching is undertaken without any reference to the sources of where it came from. It tends to be seen in isolation, whereas in fact it is part of everything that leads to compassionate living. In Buddhism, meditation enables you to understand the mind, to shape the mind, and to free the mind. There is also a moral purpose to how mindfulness is used. In their feedback, participants called for more similar training sessions. One said that it was “great fun and informative”. Another called for workshops on “science, spirituality and mental health”. Many related to examples of meditation practice shared by the trainers. “I used to hate role-play – I actually enjoyed these past two days”, said a participant.